Eleanor Louise (Hay) Witt, age 90, of Mechanicsburg, passed into the arms of God on Sunday, July 22, 2018. Eleanor was born on Saturday, April 14, 1928 in Elk Lick Township to the late Edward Hay and Althea (Engle) Hay. Eleanor was the widow of Robert E. Witt, who died on August 8, 2000. In addition to her parents and husband, Eleanor is preceded in death by her brother, Albert Hay; and her two sisters: Ruth Miller and Jean James. Eleanor’s survivors include her two sons: Donald “Don” Witt of Richmond, VA, Jeffrey “Jeff” Witt and his wife, Kathy, of Mechanicsburg; her two grandchildren: Jessica Martin and her husband, Derek, of Harrisburg, Michael Witt and his fiancé, Catherine, of Pittsburgh; her great-grandson, Jack Martin of Harrisburg; her sister, Lela Vena of Meyersdale; and several nieces and nephews. Eleanor retired from the Mechanicsburg Area School District, after 20 years of service working as a cafeteria cashier. 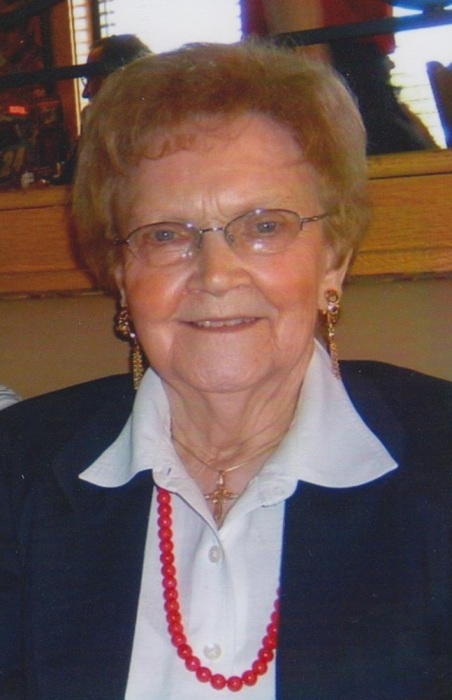 She was a member of St. Paul’s United Church of Christ in Mechanicsburg since 1971, where she taught Sunday school and was a member of the Pollyanna’s Club. Eleanor was quite the fashionista with a knack for accessorizing. She loved to go shopping, especially for jewelry. Eleanor took great care of herself and was well-read on nutrition and vitamins. She was a very vibrant woman who always remained young at heart. Eleanor found the most joy in her family. She absolutely loved to spend time with them, especially her grandchildren. All are welcome to join Eleanor’s family at her memorial service on Saturday, July 28, 2018, at 11:00 a.m. at St. Paul’s United Church of Christ, 626 Williams Grove Road, Mechanicsburg, PA 17055; with Pastor Allyssa A. Boyer officiating. Interment will follow at the church. Cremation was private. Eleanor’s family has entrusted her care to Myers – Buhrig Funeral Home and Crematory in Mechanicsburg, (717) 766-3421. Read Eleanor’s full obituary, view her picture, and sign Eleanor’s official guest book at Buhrig.com.